Hip hop producer of the moment Kanye West has decided to venture into the sounds of house music for his upcoming single 'Stronger'. 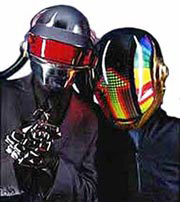 This mash up of electro and hip hop features samples from Daft Punk's 'Harder Better Stronger Faster' with the pioneering duo giving full support to West and will even appear in the music video (with their helmets of course). This could be an attempt to win the "Best Video" at the European MTV Music Awards, which West lost to Justice and proceeded to freak out. Either way, since more and more hip hop heads are pushing up the bpm's and sampling from a different crate, you'll be sure to hear more of these kinds of mixes in the future. "Stronger" will be tentatively released in June, however no date has been announced at this time.